Since then I have shared the stage with some of the best comedians in the business such as D.L. Hughley, Monique, Kevin Hart, Earthquake, Tony Rock, Bill Bellamy, Tracy Morgan, Maze featuring Frankie Beverly, Patti Labelle and S.O.S Band and many many more…. 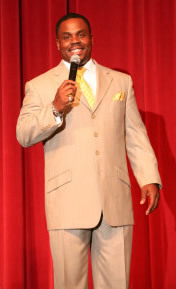 While my tv appearances include Showtime @ the Apollo and Bill Bellamys “Who Got Jokes on TV ONE. The movie Evan Almighty….but if your TV isn’t the same size as a movie screen…..you just might miss me! When I am not on stage, I love to watch SPORTSCENTER ALL DAY! !